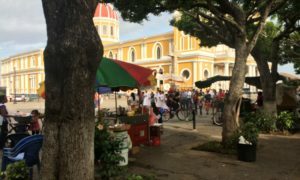 We have been in Nicaragua for over 3 weeks now and although we are enjoying our time here, we have struggled to get into a groove. 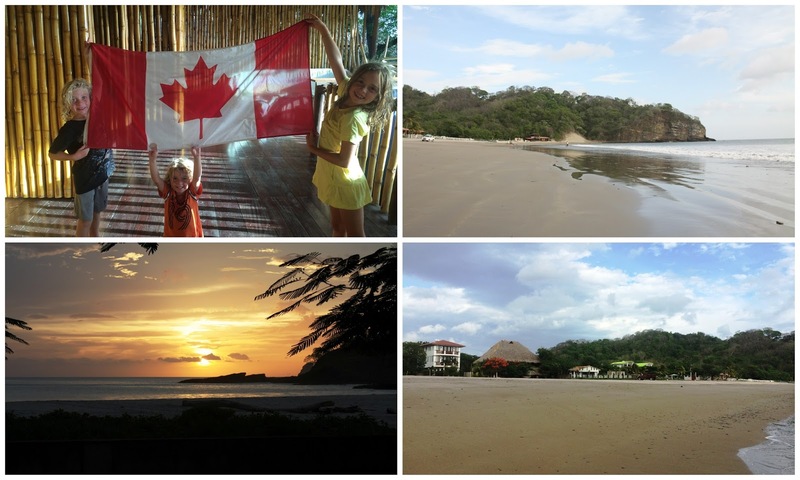 We are not sure if it is because we are on the tail end of our 6 months away, the nature of travel in Central America, travelling with 3 young kids, or the stress of trying to keep our trip on budget each day, or our daily struggles with the language. Maybe it is a combination of all of these things and maybe it is also that we miss our lifestyle on the boat. Neither Paul or I ever got to the point of feeling like we were ready to be done with cruising and maybe that is a sign. We love backpacking and we love bringing our kids backpacking, but it is a lot of hard work for everyone. Especially for the kids, it can be hard to not have a regular routine, much less a regular, comfortable place to sleep each night and to have to eat different foods. For the adults, the sibling bickering can be quite intense when in a hostel or on a public bus and it can be difficult to keep the kids entertained during down time. Most of the time our kids do really well with traveling and adapt to any situation we throw at them. They love exploring each new place we stay and telling our life story to other travelers. Tonight at our hostel we have this funky 2 story room with the kids upstairs and they think it is a little playhouse. But we miss having a “home” even if it is a boat and so we have decided to come home a bit early. We have 9 more days left to enjoy Nica and then we will be back in Canada, which brings its own set of worries and adjustment challenges. Already I am anticipating missing all the time we spend together without all the distractions of life. I shouldn’t worry too much because we have until September before I go back to work and the kids to school before our lives get hectic and of course we will continually and consciously work on trying to maintain a level of calm and simplicity we have gotten used to. 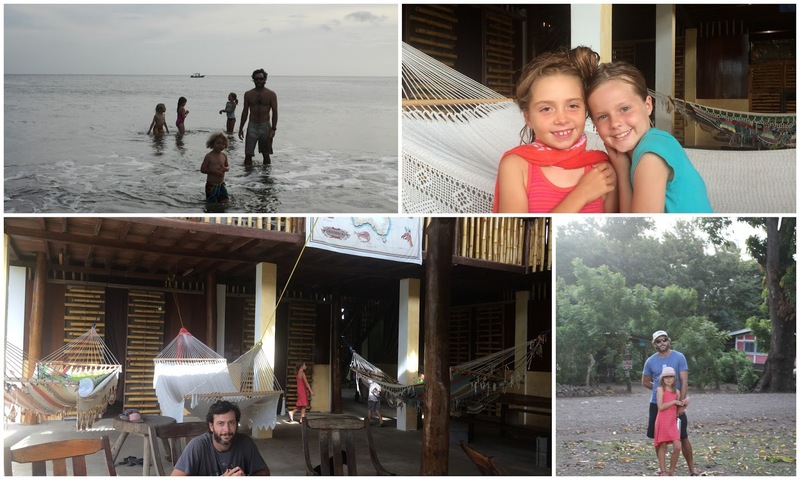 From Ometepe, we headed to the Pacific beach for a few days. 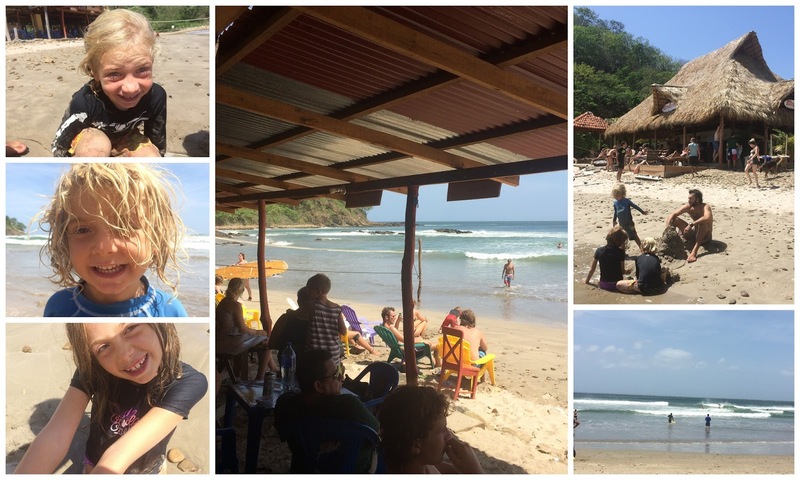 The popular backpacker haught is San Juan del Sur and the guidebooks warned of its party reputation, so we steered clear of it. 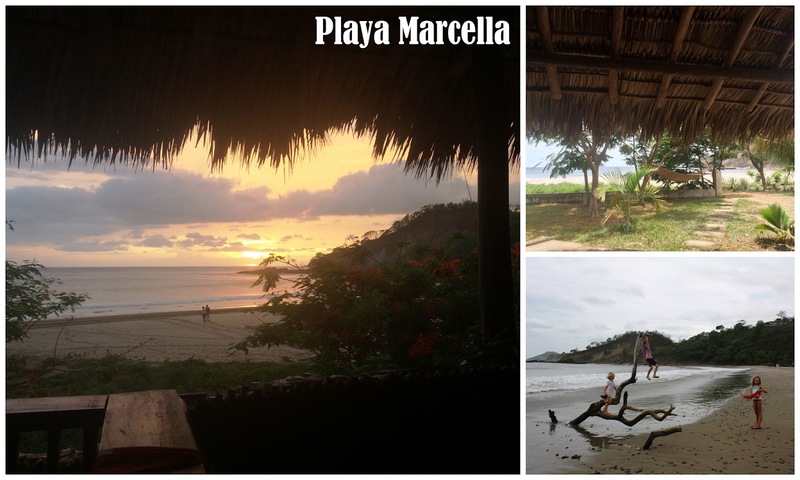 Instead we opted for a quiet beach just north of there, Playa Marcella. We found this home owned by Australians right on the beach, in a Robinson Crusoe thatch style. We rented a room from them and our kids really hit it off with their 8 year old daughter. We could barely tear them away to go for a walk on the beach or a swim. 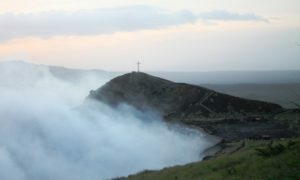 Nicaragua is known as a solid surfing spot and a lot of the beaches are not that suitable for swimming. We did wade in and jumped the waves, but were always a little conscious of rip tides and under currents. The really good surfing beach was one beach north and we spent a great day there. It was fun watching the surfers and even the kids got really excited to give surfing a try (later in the week). We really didn’t do very much – lots of lounging in the hammocks (Nica has hammocks everywhere…possibly even more than Thailand!). 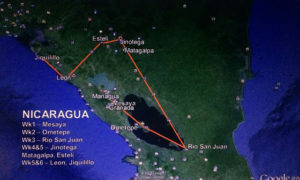 Planning your trip to Nicaragua? Check out our 1, 2 and 3 week itinerary suggestions. 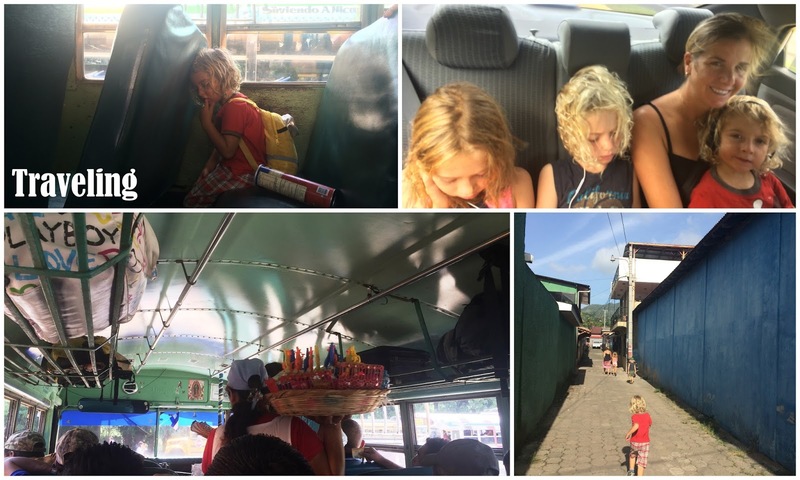 The next area we were headed was the northern highlands, but the kids really wanted to go back to Casa del Agua in Grenada. We figured we had some extra time and it was a pretty great guesthouse, so why not? Gerry, the Irish owner is just fantastic and we absolutely loved this place. We met up with a family that we met in Ometepe for dinner and had a great time sharing travel stories (they are teachers in Costa Rica). We spent lots of time just soaking up the great atmosphere at Gerry’s – the lovely coffee, lots of cartoons for the kids, free cereal and I managed to get sick. 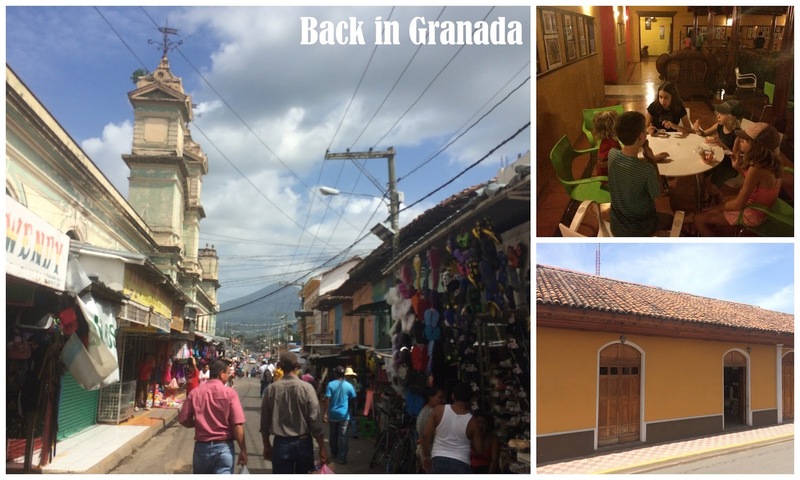 Read our full post on Granada and see why we loved this city. 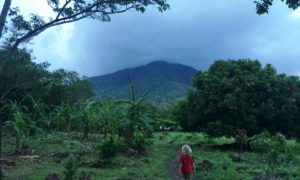 We headed up to Matagalpa in the northern highlands and it was so nice to leave the hot and humid weather of the south and feel the cool air of the mountains. 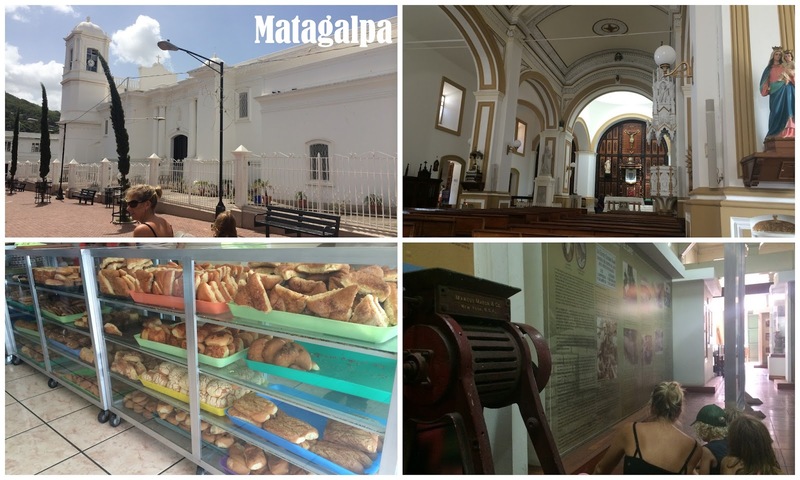 We thought Matagalpa was a lovely city set in a valley with barrios (neighborhoods) rising up on the hills surrounding it. We came up here to enjoy that cool air, check out the cloud forests and see coffee being grown. We visited the coffee museum to learn about the production and consumption of coffee and how it relates to the politics and economy of Nicaragua. This area has also played a large role in the revolution as a Sandinista stronghold. We seem to be eating more and more non-Nica food lately and in Matagalpa we found a great Italian place and a great Mexican restaurant. At our hostel, we met a Dutch family backpacking with a 9 month old and a couple traveling with their two large dogs. Really goes to show you that at any age or stage, you can travel. 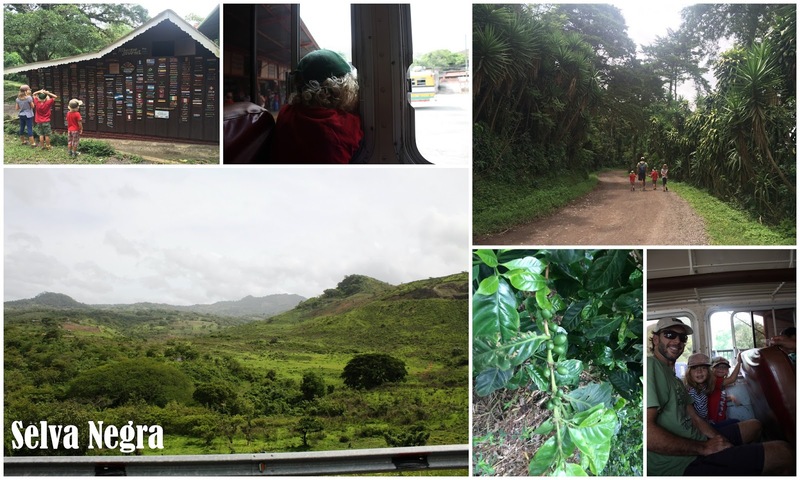 We took a daytrip to Selva Negra, a coffee farm owned by Germans that settled in Nica in the 1800s. 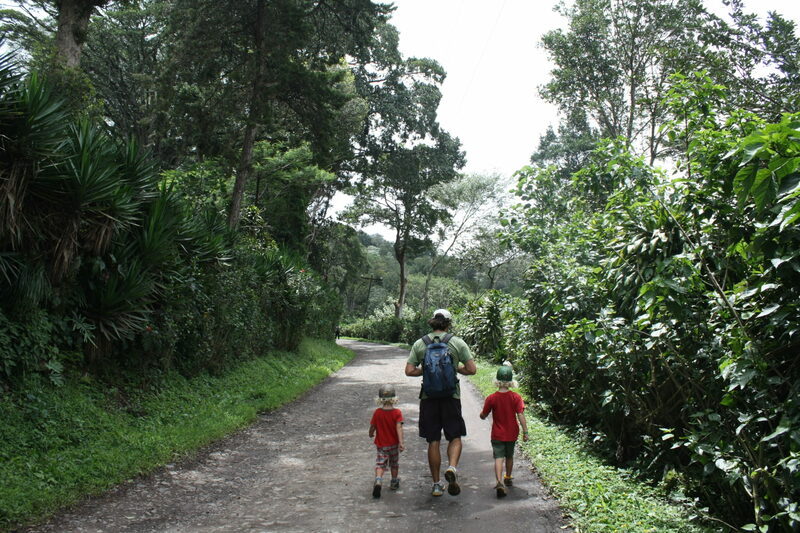 It is a lovely place in the cloud forest mountains with a lovely lake and hiking trails and an eco-lodge and the most amazing children’s playground. On the way there on the chicken bus Gavin had his head out the window taking in the beautiful mountains as we climbed 2,500 ft when his hat flew off. He loves this hat from Harbour Island, Bahamas and with only a minute thought, Paul handed me our backpack and jumped off the bus to rescue the hat. Luckily the bus was climbing really slowly up the hill and Paul was able to retrieve the hat and race after the bus and get back in. I am sure the driver got a good laugh at the gringo chasing the bus, but he eventually stopped so Paul could hop back on. But running at full speed chasing a bus at this altitude was hard work and he spent the next 20 minutes recovering. 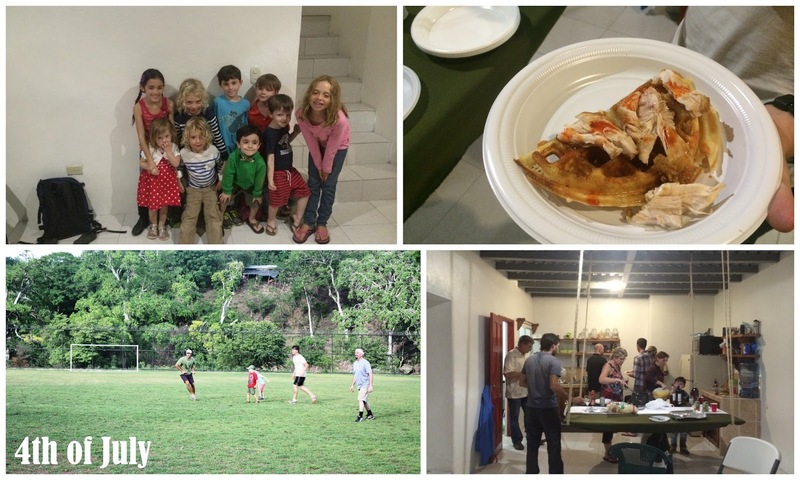 While eating lunch, we met an American family that is living in Matagalpa and the kids hit it off right away. When the rain started, they offered to drive us back to town and we were more than happy to not have to walk 2 km and take the chicken bus in the rain. They also invited us to play ultimate Frisbee (how could Paul say no?) that afternoon and then to a 4th of July party that night. While on the boat or backpacking, we are so thankful for the hospitality of random strangers. Ben & Sheena are part of a large group of evangelical Christians working in this area on development and spiritual projects and they also own this fantastic home-made, gourmet ice cream shop in town that is amazing. It really made me think about challenging our family to centre our life more around what we can do for others. The kids and I had a long conversation about street children, which led into the causes and effects of poverty and I hope by being frank about issues like abuse and substance abuse, the kids can better understand the world and its challenges. And let’s be honest, I also want them to appreciate how good their lives are and to stop nagging me for candy or whining about having to go on a hike. If we weren’t going home early, we probably would have spent even more time in this area of the country, but with plane tickets booked we had to keep moving. Our last 9 days here will be spent in the colonial city of Leon and a full week on the northwest Pacific beaches. La Buena Onda, $35/triple including breakfast, shared bathroom. Decent place, good location. La Vita e Bella, Matagalpa – Italian place, great foods, we went there twice. Coffee Museum, Matagalpa – free. Lots of good english signage; educational. 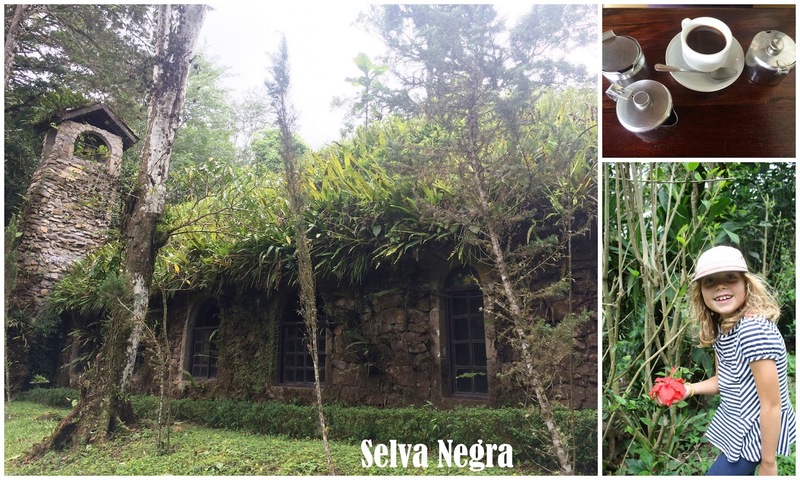 Selva Negra – took the local bus there. We walked around the grounds and had a nice lunch.